Review: "Van Canto: Tribe Of Force" - Sea of Tranquility - The Web Destination for Progressive Music! Six piece German band Van Canto are quite unique, you see they are missing something, that something being instruments, there are drums beating away but that's it. So what do the other five members do? Well they sing and replicate the sounds of instruments with their voices, bass, guitar and keyboards, creating an interesting album of a capella metal. I have to admit wanting to hear how they tackle "Master Of Puppets" first- come on what metal fan hasn't sung the guitar parts on this one? Van Canto has previously covered "Battery" from Metallica and also put their spin on other popular metal tracks including Nightwish's "Wishmaster" and Blind Guardian's "The Bard's Song". Van Canto have recorded an impressive heavy cover and stayed faithful to Metallica's classic, with plenty of vocal riffage and powerful vocals. With an a cappella intro to "Lost Forever", the drums kick off and other members voices fill in the gaps, they also throw in a guitar solo, the solos on Tribe Of Force do sound quite realistic, like on the impressive "One To Ten". Other standouts include "Last Night Of The Kings"; this is a vocally strong Blind Guardian type ballad, and the previously mentioned "Lost Forever". 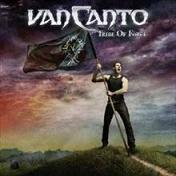 Van Canto don't cut corners with the songs on Tribe Of Force, everything you would expect for this style of music is on here, and the production is spot on thanks to Charlie Bauernfeind (Blind Guardian). As for guest appearance, they have Tony Kakko (Sonata Arctica) on "Hearted", Victor Smolski (Rage) on "One to Ten", and the cover of Grave Digger's "Rebellion" has Grave Digger's own Chris Boltendahl. The vocals and drumming is all top notch, so how successfully do they replicate the other instruments? Well, Van Canto do a very good impression, but for metal music you still can't beat the real thing. That being said, I still enjoyed this their third release, and have to give them credit for uniqueness, and the way they have composed the songs. You can sample Van Canto's material on their home page (see link below), which would be wise before purchasing Tribe Of Force, as it's quite different from the normal melodic power metal release.